have many belt holsters to choose from. Phalanx Defense Systems Stealth Operator Full Size Holster gives you concealment and security in one. Phalanx Defense utilizes their signature Frame-Lock™ retention system to keep your magazines securely holstered. The Stealth Operator is made of strong nylon that is lightweight, easily cleaned, and flexible enough to move with you in action. This holster features a forward cant. Wear this full sized holster outside of your waistband (OWB). 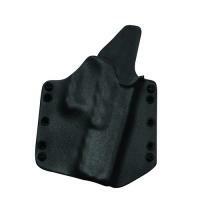 Phalanx's Stealth Holster is intended for right hand shooters only and fits many full sized models. Terrible holster don't waste your money.